What freedom do you still want or need? Where would you like to breathe easier, more reassured? If you know Christ, have you considered your many freedoms here? If you don’t, doesn’t this sound like an amazing liberty to live walking with a holy God in direct relationship and abundant peace? I pray that you know how deeply God loves you to send His Son Jesus to purchase these freedoms for all of us on that cross. **It has also been shared at any link highlighted here: Mom 2 Mom Monday Link-Up, Make a Difference Mondays, Pick Your Pin Tuesday, Women With Intention Wednesdays, Grace & Truth, A Little R & R, RaRa Link-Up, Theocentric Thursdays, Me, Coffee & Jesus, Dance With Jesus, Blessing Counters, Coffee & Conversation, Saturday Soiree, Tell His Story, Find Stability, So Much at Home, Faith-Filled Fridays, Reflect His Love and Glory Link-Up, and Christian Mommy Blogger. I am free to say, well done my friend! What a great reminder of what we have in Christ. Thank you, Bonnie #2! I love reading the list. We all daily need this reminder! Powerful, powerful list of freedoms! So many of them I take for granted. Thank you for listing them all in one place – there is much to ponder here. And much to be oh-so-grateful for! Thanks, Sharon! It’s great to have it in one place, isn’t it? It’s overwhelming, and I clearly missed so many, but it was so fun to look these up! Blessings! 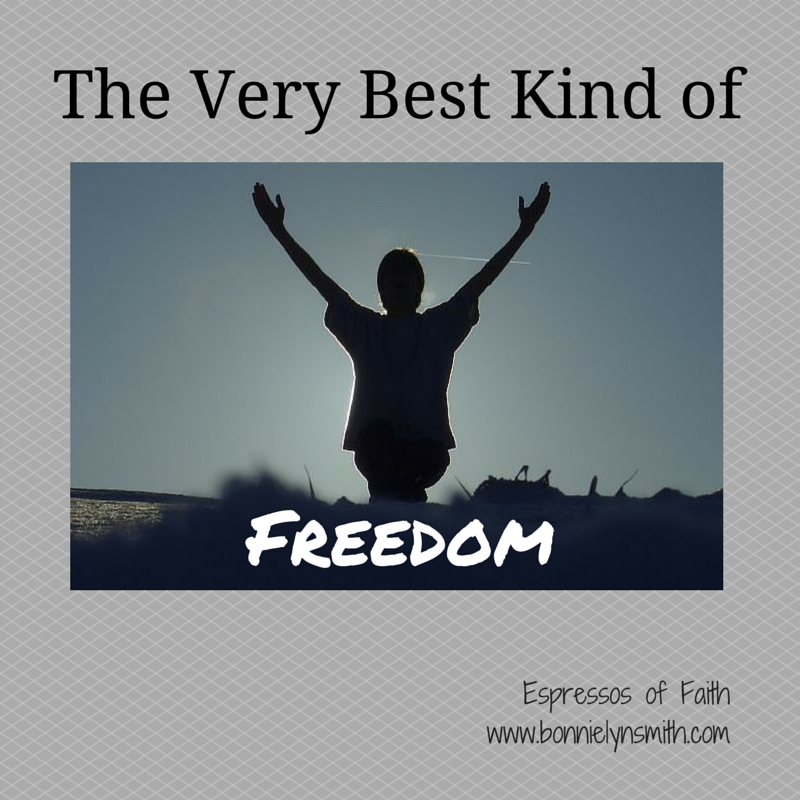 What an awesome list of freedoms we have in Christ! Just out of curiosity, how long did it take you to compile this list? Hi, Carrie Ann! Thanks for coming by! It is quite a list, and I am sure I am missing so many of them! 🙂 It took me about an hour and a half. I’ll try to jump on to #TheocentricThursdays this week! Thanks! Blessings! Wow. You must be a quick processor. I get so distracted when looking things up that it takes me forever! Now this is real freedom! Love it when you open our eyes to the Lord’s revelations. Thanks, Mary! It’s an amazing list, isn’t it? So affirming and encouraging! What a great list of “freedoms”! I started to make a mental note of the ones I loved most, but there were so many!!! Free to love, to forgive, to give … and none of them conditional on whether or not I get anything in return. I wish I could remember the quote perfectly, but I have heard it said that If we only understood that everything we ever need, we already have in Christ, we would stop trying to extract it from others! Thanks for a great post and so many great reminders! I love the quote you refer to, Donna! I love that! So true about not being conditional. Simply promises! Amazing! I agree we try so hard to get it from other people when they can’t possibly offer what He can! Thanks for coming by and encouraging me so much! Blessings! He’s given us SO much freedom – but do we really thank Him for all of it? I don’t think we can ever thank Him enough, can we? Good point, Coupon Diva! Love this one. I retweeted it and I will keep it and read it over and over. Will share in the next few days on my FB author page. This is important to remember. Oh how we sometimes take God’s gifts and grace for granted and keep ourselves in the chains of mental, emotional and spiritual prisons. I teach the Lord’s Prayer in dance classes and at churches around the country. At the part where we ask to be delivered from evil, I demonstrate breaking of chains. Freedom. That’s right. So kind of you to RT and share it. I really appreciate that, Living What You’re Given! I absolutely love your image of breaking chains in dance. I love when our church has liturgical, expressive dance for us to worship while we watch. It’s so beautiful! Thank you so much for coming by and encouraging me! Blessings! Hi, Brenda….that’s a good idea. I need to do that. Maybe I can include it with my next newsletter. Thanks for the great comments and for visiting #EspressosofFaith! Great post Bonnie. While I appreciate the freedom we have in Christ immensely I wouldn’t have even thought of it in the many ways you have outlined. Awesome work. Thanks, Tony….I need to come check out your new site! Looking forward to that! Thanks for coming by! I’m so happy you know this freedom too!